You rock! .dll errors are gone. but making tons of progress. Light years ahead of where we i was when you started helping. That's good news. I'm not sure what we are gonna do about the error loading C:PROGRA~3\nbrf3bo9.cpp. That file was flagged by aswMBR as infected with a rootkit. So we deleted it. Then MalwareBytes found it in the OTL\MovedFiles folder and deleted the whole folder. If it were still there we could restore it but then we would be loading an infected file. Let's run the big hammer and see if it can find anything. ComboFix will then extract it's files before beginning the scan. When the scan begins you will see a window like the image below. Although the program states that the scan typically doesn't take more than 10 minutes there are 50 stages or so that it goes through. On a severely infected machine it can take much longer so please be patient. 3. If you receive an error "Illegal operation attempted on a registry key that has been marked for deletion". Please restart the computer. That will cure it. A word of warning: Neither I nor sUBs are responsible for any damage you may have caused your machine by running ComboFix on your own. Well I found the bugger. I thought I had removed this in my first OTL fix, but it looks like I overlooked it. Let's kill it now. After this the .cpp error should go away. 2. Let me know if there are any more issues. That did the trick. Finally get a clean start! No more issues that i'm aware of. Here's the OTL fix log. That's great news. The clean up is gonna be rather lengthy. We used a lot of tools and files and they need to be removed. It's gonna take a little time to list them all so I'll be back when I have them ready. It is important that we remove them so please stay with me a little longer. And I need to give you some suggestions to help keep the computer more secure in the future. Understood, and appreciate all the time you've spent helping. You, and your fellow Malware removal gurus do a great service. It was my pleasure and thank you for the kind words. If you didn't uninstall ESET after running the program we will do it now. Along with the Windows Repair (All-In-One) program. Click the Start Orb and click Run. This will display the Run dialogue box . Windows Vista: In the Available Disks box put a ckeck mark in the box next to OS (? :) (System). Your drive letter will be shown in place of the ? Windows 7/8: In the Protection Settings section, make sure the protection for the System drive is ON. If it isn't, click the Configure button and turn it on. NOTE: If there isn't a More Options tab then click the Clean up system files button at the bottom of the window. Disk Cleanup will reload and the More Options button should be visible. Right click the CryptoPreventSetup.exe file and click Run as Administrator and OK ant UAC prompts to install the program. Next, Right click the Cryptoprevent icon on the desktop and click Run as Administrator and OK any UAC prompt to run the program. Thanks again. I repped you for your help. 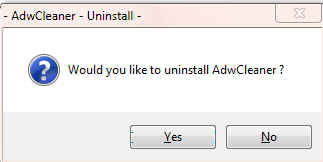 Not a big deal, but having trouble uninstalling ComboFix. Windows cannot find 'ComboFix'. Make sure you typed the name correctly, and then try again. The properties of ComboFix on the desktop have 'ComboFix' as the program name. I'm not terribly concerned, just thought i'd relay the information. I will continue working through the rest of clean-up/updating my computer settings. If you haven't already run the OTL CleanUp button, try uninstalling ComboFix from Safe Mode. I have not done the OTL clean-up. I tried the ComboFix /Uninstall command both from Safe mode and in regular mode with Avira turned off, as well as ComboFix in varying case structure (i.e. combofix, ComboFix, Combofix, COMBOFIX) - all yielded the same result as before. OK let's try it a different way. In the list of programs at the top of the Menu right click cmd.exe and click Run as Administrator. A black Command window will open. At the blinking cursor, right click and click Paste. This will put the text in the Command window. Back at the blinking cursor type exit and press the Enter key to close the Command window. That did the trick. Will be working through the rest later today.